Hey all. This is my first blog ever, so I thought it would make sense to introduce myself and give you a good virtual handshake. My name is Mike, and I am currently finishing my M.A. Education at DePaul. My plan is to work in the Chicago Public Schools as a high school social studies teacher next fall. In fact, I currently work as tutor and teacher assistant part-time at a high school in Garfield Park on the west side. This whole teaching thing is an abrupt career change for me actually. Professionally, up until now I was a programmer. For the last 10 years I have worked in various positions around the city… web development, database development, software development. I could have probably gone into management, made a lot of money, and stayed on that path forever. But cubicles make me itch. There was something missing. I decided to take a risk. I quit my job and went to DePaul to pursue a graduate degree in Education. Well maybe not that big of a risk… I mean the teaching thing is new, but the social studies thing is really a return to basics for me. See, years ago in Madison, I earned a degree in International Relations. Issues of social justice and a desire to see more participation and equal representation in our democracy were – and still are – what gets me fired up. I decided to escape the board room and get more involved with my community. It's that simple. While at DePaul, I have also taken certification courses in Geographic Information Systems (GIS). GIS is all about making maps. Give me addresses and associated data, and I can map it to show whatever trends you want. I worked this past summer for Loyola University's "Center For Urban and Environmental Policy and Research," helping the university map human resources. GIS works great for human resources. But it's also an amazing tool for exposing social and environmental trends. Poverty? Crime? Migration patterns? Toxic sites? School performance? These topics are just scratching the surface. My goal as a social studies teacher is to ultimately use GIS in the classroom to help kids visualize issues pertaining to their world, be it political, social, or environmental. I have learned that kids at my high school are seriously concerned with the conditions of their neighborhoods… and why wouldn't they be? My aim as a teacher is to help them research, think critically about, and address issues that concern them as citizens. GIS is the perfect tool for this job. Another thing I have learned over the past year is that most of my students have the potential to become incredible leaders. Unfortunately, many of them have had years of subpar academic experiences, and many of them have been told either directly or indirectly that they aren't capable of high achievement. That sort of abuse will take a toll on anyone's ability and psyche. I really believe that more folks need to believe in, and invest in these incredible young people. More people need to shed their misconceptions about city kids and really get to know them. I come from a high performing school in the suburbs. I grew up with many of these misconceptions. I'm here to tell you I was wrong. There is not a day that goes by where I am not amazed with my students' potential, and there is no doubt in my mind that, with guidance and a little confidence, underserved kids have the ability to be a force as leaders in our communities. Cabrini Connections and Tutor/Mentor Connection are organizations of people – many of whom volunteer their free time – who have beat me to these realizations. The man in charge, Dan Bassill, is a gentleman with no shortage of enthusiasm for – or confidence in – our kids. I mean here's a guy who has dedicated the last 30 years of his life working to empower youth in Chicago. So when I learned that Dan's organization needed a GIS/Map specialist, it was almost too good to be true. And an easy job offer to accept. Honestly, I just got here a couple days ago and my head is numb from all of information being thrown at me, so at this point I can't explain with absolute certainty everything that goes on around here. But as I understand it, "Cabrini Connections" pairs kids from Cabrini Green with volunteers from all over Chicago, and then provides a meeting place and activities for relationship and skill building. The hope is that, by giving kids after-school opportunities to meet people from different walks of life, kids AND volunteers will walk away less ignorant of each other, and ultimately kids will have new tools, professional contacts, and greater confidence when they apply for colleges or jobs. I met two of the students yesterday. One of them has been with the program for over five years. During that time, he has graduated high school and is now taking classes at a local design school. He was in the office my first day, doing his homework on the PC next to me. The other kid is busy these days working with a group of student/volunteer pairs on a video documenting the past, present, and future of the Cabrini neighborhood. I can't wait to check it out. I'll actually be more involved with the "Tutor/Mentor Connection" part of the project (I think), which advocates on behalf of city kids everywhere. 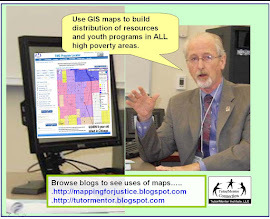 Using GIS, my maps will be used in a variety of ways - to help promote and coordinate work Cabrini Connections and other tutor/mentor programs are producing across the city and beyond, to raise local awareness by exposing social justice issues to the media, and to help educate community and business leaders on the benefits of investing in city kids today. So there you have it… my professional background is with computers -- programming mostly, but my place in the world is hopefully helping underserved kids become the leaders I know they can be. Through teaching, learning, and GIS, I am hoping I can make a difference. Very nice to meet you. Catch you soon (once I find my way around this place).